If you have ever been music curious, here is a safe and easy way to get started! Learn to play a stick dulcimer. A stick dulcimer is a three stringed instrument, very closely related to the mountain or Appalachian dulcimer. But instead of playing it on your lap, you hold it like a guitar or ukulele and strum it. What makes it a “dulcimer” is that it only has notes in a single key. That means it sounds good. Always. No matter what you do! With a stick dulcimer in your hand, your anxiety and fear melt away, freeing your true self to emerge in glory! No instrument can be mastered without practice. With a stick dulcimer, practice becomes endless delight. The dulcimer takes care of the notes - you always sound great - you just concentrate on timing and rhythm. This lets your fingers learn the mechanics of strumming and fretting without fear. You will receive your own Strumbolina stick dulcimer for this class, made from reclaimed old growth douglas fir. It was a tree for a thousand years, then a rafter on Vashon for another hundred years, and now it is a musical instrument for you! The first day I’ll explain all the parts of the instrument and show you the basics of how to strum and one-string fretting. Overnight some of that practice will have leaked from your brain to your fingers and on the second day I’ll show you some tricks and we will work on composing a song! Mastering the basic mechanical process of strumming and fretting will prepare you to learn to play other stringed instruments - ukulele, guitar, banjo, or whatever you like. 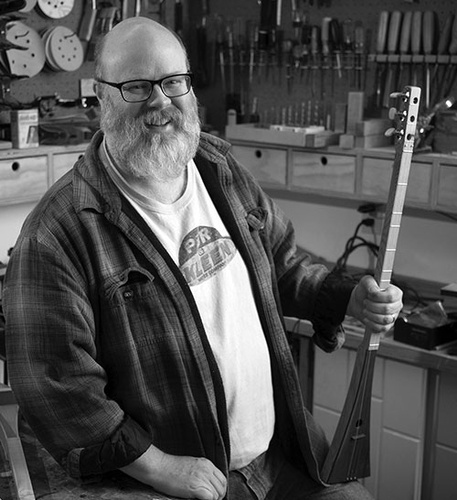 Joe Schonbok is a mathematician by education, a software developer by trade, and an aspiring luthier by passion. In 2016 he built a classroom set of stick dulcimers for Chautauqua Elementary and continues to build dulcimers and other instruments to entice people to bring more music into the world.